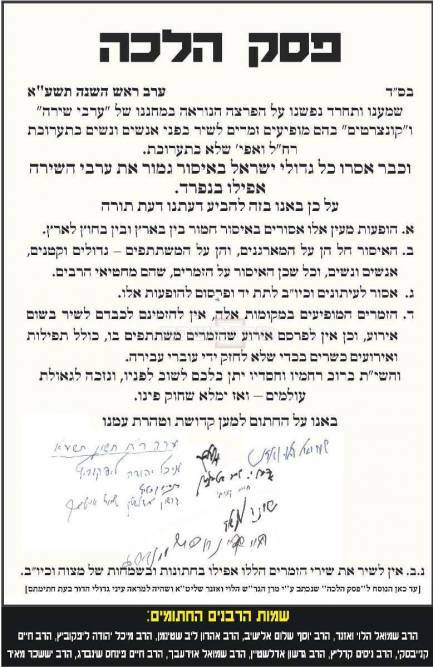 As pointed out by Rabbi Sedley at Life in Israel, this is dated from before Rav Elyashiv is reported as refusing to sign this ban. So what is going on? The poster speaks about the severe issurim involved. Which issurim are they, exactly? Are those who insist that one must follow the Gedolim, and that Rav Elyashiv is the Posek Acharon (whatever that means), going to be consistent and insist that people must follow them in this too? Cynic that I have become, I wonder if it's all a matter of competing interests amongst different askanim. "Cynic that I have become, I wonder if it's all a matter of competing interests amongst different askanim. " What's to wonder? Isn't that the only rational conclusion to draw? A ban is not worth the poster paper it's written on. Those propagating it need to show us a real halachic teshuva written on the issue, or get out of our faces. What sloppy handwritings most of them have! I have always conjectured that there's a connection between someone's handwriting and the nature of his soul. Then my soul is in very, very bad shape. In that case, I apologize. But don't you find it to be the case that many great men in history had beautiful handwriting (although I imagine a much heavier emphasis on studying penmanship had an effect on this)? Getting back to the point of this post, I of course agree that issuing a contentious ban rather than offering an intelligent, sober, cogent argument for your beliefs in the year 2010 does not have a very positive effect on most people. 1. Remember that some of these people are pushing 100 years old or have already surpassed it. 2. Even if authentic (and certainly if not), the signatures are probably lifted from some other poster, so they don't fit on the lines. Personally, I think R' Amnon Yitzchak's concerts are far more prust. Are my eyes deceiving me? They even have the audacity to attempt to ban music at weddings? When did Klal Yisroel ever listen to a psak from a poster? psak halacha is either found in a published book of Piskei Halacha (e.g., Igros Moshe, SHUT Chasam Sofer) or by asking your Rov. I feel like Archie Bunker (for those who unerstand my reference) by saying "ignore them"
This is clearly a fraud. Maybe this will be the event that blows this whole issue wide open? The issue has been blown wide open countless times already. Which is why the number of followers of the Gedolim is continually dropping. "FRAUD ALERT: There are two different dates on the Kol Koreh"
probably the top date is for the text of the kol koreh while the bottom date is for the signatures. R. Slifkin - do you have any evidence for that? Preferably non-anecdotal? No, it's just my impression. I plan to write a post on it and do an informal survey. I like how they clarify that their opinion is "daas torah"
It's riddiculous, assuming this does actualy represent the views of the signatories, and very few people, even in the Haredi world, would listen to this nonsense. But such a ban doenst have to convince many Jews to be successful. All it must convince, through whatever means possible, is a couple of performers, a couple of promoters, and perhaps the venue owner. Would that they simply told the busybodies to take two running jumps and go to - -. I'm not sure the number of people following the gedolim is dropping. I think that people are simply adjusting their standards of what it takes to actually believe that something is the authentic opinion of the gedolim. Between manipulative "askanim", fraud, and corruption of messages with every hand (or mouth) they pass through, many people have simply adopted the position that if they haven't heard something from the Gadol's mouth directly, or at most one step removed from a trusted third person, they simply won't accept it as the opinion of the gadol in question. And frankly, I don't see why you would be obligated to. …the number of followers of the Gedolim is continually dropping. Rabbi Slifkin, I respectfully disagree. I find the opposite to be true. More and more people that I knew to be more “center” in their religious views have starting quoting “the Gedolim” and moving more towards the right. This seems to be a cultural push of some sort which is gaining in popularity. Is it possible that as more people find your work you then become exposed to additional people who do not “follow the Gedolim”, which may be why it is your impression that such is the trend? From my (very small) vantage point, the push seems to be moving more towards the right and the right seems to be moving more towards blind faith in “the Gedolim” (much to my disappointment). Does anyone have any statistics about gedolim following? Most of what I see is anecdotal or conjectural. Also, could someone define "gedolim following"? I have been wondering when and where the term "Daas Torah" originated I have only heard it over the last ten years or so. Natan, your handwriting used to be the neatest in the class! What happened? This is wild, posters like these only alienate growing numbers of people. As the "issurim" become more all encompassing so the people listening to them drops, thus narrowing the circle of "ksherim". It seems to me that whereas ten years ago discussion of the Gedolims opinion was respectful and assuming them to be right even if we didn't fully understand, today many more "frum" people allow themselves to criticise. 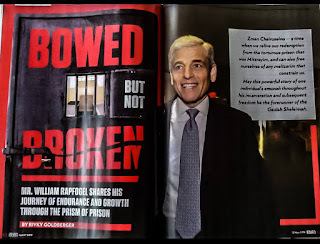 One executive of an organisation that has a lot of contact witht the gedolim told me recently that he has been present as the aformentioned askanim mislead gedolim and he could do it himself if he so wished. I recently learned an eye-opening piece in Meseches Shabbos Kuf Lamed Tes Amud Alef. The Gemara addresses why calamities befall the Jewish people. Instead of pinning it on the average Jew, the Gemara there puts the blame squarely on the shoulders of the leadership. Interesting reading, particularly the statement there about Judges who become a "stick" for their handlers. Prophetic or just plain human nature? Rav Moshe Feinstein actually has written a teshuvah forbidding music for non-mitzvah purposes. Nobody listened. I can't believe that no one has mentioned the Talmudic (Rif, Rosh, Ramban, Ritba, Ran et al.) and Halachic (Rambam, Tur, Shulchan Aruch et al.) assertions that זמרא אסור (both with musical accompaniment and otherwise) except in a strictly religious and liturgical context. This is aside from the איסור of singing פסוקים at all as codified in Magen Avraham (560, comment 10). Heterim only exist for weddings and synagogues. ידוע שעצם הזמר והניגונים כלם אסורים אפילו אין אומרים עליהם מלים כלל לאומרם ז"ל אודנא דשמעא זמרא תעקר. וכבר באר התלמוד שאין הבדל בין שמיעת הזמר או ניגון על מיתרים או השמעת הנעימות בלא מלים אלא כל מה שמביא לידי שמחת הנפש והתרגשותה הוא אסור כמו שאמרו וסמכו דבריהם אל איסור הנביא שאמר אל תשמח ישראל אל גיל כעמים. Excellent point, RatioWatch. I feel that R' Slifkin could (or should) make a whole new post about it, and would look forward to it.